Copyright (c) – Sony Music Entertainment (Japan) Inc.
Phonographic Copyright (p) – Sony Music Entertainment (Japan) Inc. Manufactured For – Ship To Shore Phonograph Co.
'Hot Spring Pink' variant. Comes with an obi strip. D3 ends in a locked groove, D4 is a hidden track separated on a different groove. Earthbound is a game I didn't play until recently, a few months ago. Considered one of the most underrated gems on the SNES, it doesn't wait at all to let you know how obtuse it is. While I'd like to go into all the details, this is about the vinyl release from Ship To Shore. For this particular review, I have the Hot Spring Pink release. I got a 'new' copy and it came with the inner sleeve seems ripped. That's the only cosmetic issue I noticed. The diagram map inside the gatefold is quite pleasant to look at. The music in-game is something one can't really describe. It's intentionally bizarre, surreal, and experimental. Yet it works! The audio appears to be from the same mixes used on the original Japanese CD release. Which loop once with some added reverb. I was hoping the songs would have played out abit longer then barely finishing one loop. And several tracks are missing (god knows how many there are altogether) from this as it is from the original 1994 CD release. Also, it should be a crime to let Moonside play as short as it does on this. Lastly on that note for those wondering, the 'hidden track' on the last side is of the bicycle jingle one can enjoy for a brief time in Twoson, tailended with the famous "Okeska" voice sample. Audio sounds like it was properly mastered. However the pressing isn't the best. While there are worse culprits, the surface noise is pretty noticeable on this especially right at the start of the first side. It shouldn't bother most people too much though. Overall, it's an alright release. The pressing could have been better and could have been presented unmixed like what Data Discs is doing. Try to get this cheaper then the current third-party market is asking for it, don't think it's quite worth the prices they're asking. There appears to be a hidden track on Side D. Track D3 ends in a locked groove, but if you set the stylus down immediately after that track, there's some more audio. 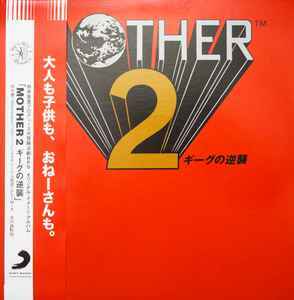 I've never actually played Mother 2 (I know, I'm horrible), so I won't pretend to know what the track is.